Ukraine's Agrarian Policy and Food Ministry forecasts that Ukrainian farmers will supply abroad about 16 million tonnes of wheat, including 8 million tonnes of bread wheat and the same amount of coarse wheat in the current 2015/2016 marketing year (July 2015 through June 2016). "We see that nearly half of the total amount of planned wheat exports – this is about 7.5-8 million tonnes out of 16 million tonnes – will be bread wheat shipments," Deputy Agrarian Policy and Food Minister Volodymyr Lapa said at a briefing. He also said that 16 million tonnes of wheat to be shipped for export was sealed in a memorandum signed by the ministry and grain traders. This document allows the government and all market players to determine volumes of domestic shipments and exports at the beginning of the marketing year in order to ensure Ukraine's food security. According to Lapa, bread wheat accounts for 55% of this year's total wheat harvest estimated at 26 million tonnes. The share of coarse wheat is somewhat higher this year than last year due to abundant precipitation during the harvesting campaign in some Ukrainian regions, he said. As UNIAN reported, the ministry projects that grain exports in the current marketing year will total 36.8 million tonnes. 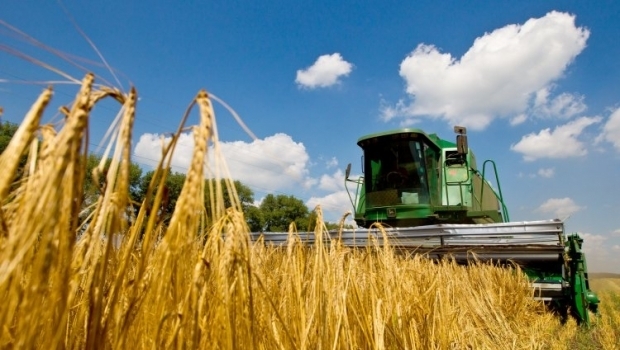 The gross yield of grain in Ukraine in 2015 is expected at 59.5 million tonnes.